Mongolia(web team): Prime Minister Narendra Modi on Sunday hailed his visit to Ulaanbaatar as a 'significant milestone' of the relationship between India and Mongolia, as he and his counterpart Chimed Saikhanbileg witnessed the signing of 14 agreements between the two sides. Prime Minister Modi also stated that India will provide an amount of USD one billion to support the expansion of Ulaanbaatar's economic capacity and infrastructure and referred to Mongolia as an integral part of his government's 'Act East' policy. Treaty between India Mongolia on the transfer of sentenced persons; memorandum of understanding (MoU) between India and Mongolia on cooperation in the field of traditional systems of medicine and homeopathy. MoU between the Indian Ministry of Home Affairs and the Mongolian Ministry of Justice for enhancing co-operation in border guarding, policing and surveillance. Programme of cooperation between India and Mongolia in the field of culture for the years 2015-2018; MoU between India and Mongolia on the establishment of cyber security training centre in the ministry of defence of Mongolia. 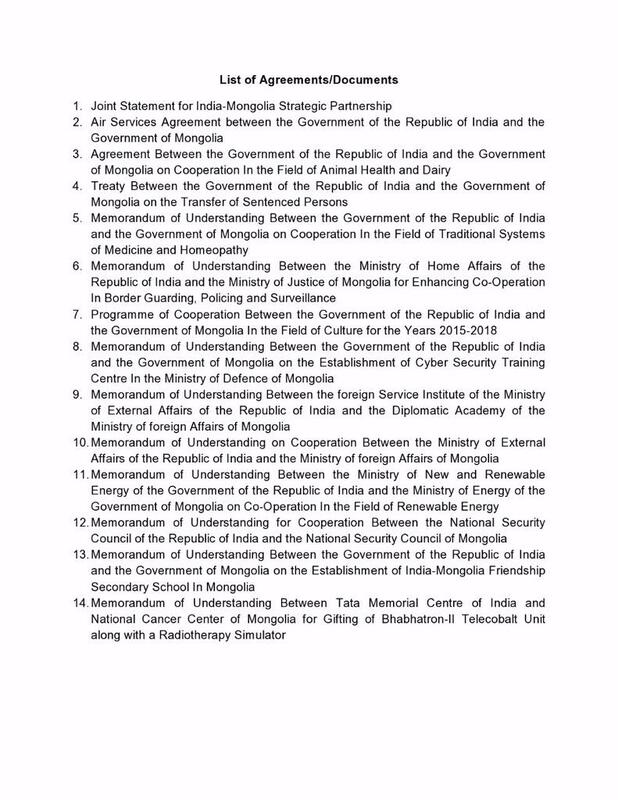 MoU between the Foreign Service Institute of the Indian Ministry of External Affairs and the Diplomatic Academy of the Mongolian Ministry of Foreign Affairs. MoU between Tata Memorial Centre and the Mongolian National Cancer Centre for gifting of Bhabhatron-II Telecobalt Unit along with a radiotherapy simulator. Tsakhiagiin Elbegdorj and will lay the foundation stone of the IT centre at the Mongolian University of Science and Technology.